By Marisa Guerin — For the last 18 years or so, I have had the opportunity to consult to many of the finest people I have ever met – the women and men of religious congregations and the ministries that they sponsor, from various denominations. These people are hard-working, kind, and faithful to their missions —- but that doesn’t mean that leadership is easy in these settings. The real-world challenges are formidable, and the internal community dynamics are subtle and complex. Religious leadership is not what it used to be! Several years ago, I started experimenting with a series of workshops as a complement to the consulting work I was doing with these clients. My intention was to offer advanced professional development seminars for religious leaders that would give them a chance to probe, with peers, the complexities of the community dynamics that were most difficult for them to manage. Over the last six years, well over 100 leaders have gathered in these learning events. 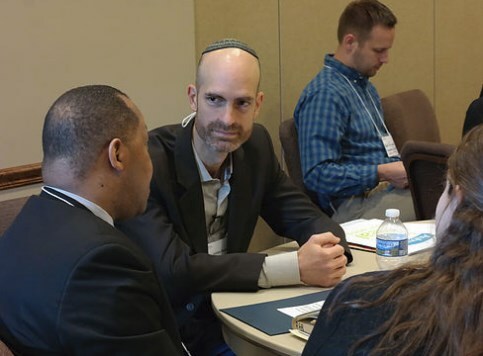 This short posting describes how the approach taken in these seminars offers a perspective that is both revealing and different for most religious leaders. I write it as an invitation to the reader to consider whether this kind of learning might be helpful. The specifics of the seminars are included at the end. How is the perspective of these workshops “different”? The focus of the analysis is on the human system rather than the members as individuals, and there is special attention given to the unconscious emotional dynamics of people in human systems. My clue for this starting point came from observing over the years that the “default lens” used by many leaders for interpreting difficulties in religious settings is often interpersonal. Leaders tended to focus on perceived deficits in competencies and in communications skills such as listening, assertiveness, conflict management, empathy, or honesty. While it is undoubtedly true that individual persons can be the stumbling block in some circumstances, I suspected that leaders might not appreciate how powerfully the dynamics of systems themselves impact the feelings and behavior of people. If the system is part of the problem, then the problems will persist even if the people change. Indeed, problematic people are often unconsciously “used” by the groups to which they belong as channels for playing out issues that belong to many, not just one. Consequently, I designed the master seminars to complement the existing base of skills and knowledge of these leaders with material from this alternate “lens”. I focused on increasing their exposure to three dimensions of human systems that show up with regularity in the current experiences of religious communities and ministries. • The first dimension has to do with the way the human system is formally structured: elements like primary task, roles, authority, accountability, and strategy. These terms sound very corporate; and in fact, if you think of a religious congregation as a community of persons, some of these concepts don’t make much sense. However, a congregation or ministry institution also lives in the world as a sustainable organization that acts in society and the church. For the congregation as an organization, these concepts do apply, and they have very powerful effects on behavior – positive and negative – that go beyond individual effort. Working with this perspective opens new insights about the value of a system perspective. I also find that it challenges the assumptions of some religious persons (especially women) that organizational concepts are in some way suspect — not relevant to faith groups, or not humanistic enough, or somehow inherently oppressive or authoritarian. The seminar exploration permits a more nuanced understanding to emerge that lets religious leaders tap the value of systemic order without falling into the shadow side of bureaucracy or rigidity. • A second dimension is directly related to the impact of structure and the role of leadership — it has to do with the unconscious psychodynamics of human systems. Families, groups, organizations, and religious communities and ministries are human social systems which activate the emotional life of persons. The seminar illuminates for leaders the psychological and spiritual experiences of anxiety, risk, trust and faith as they play out in religious groups, and how leaders can respond to these unconscious dynamics from within their unique strengths as persons of faith in community. Of all of the material covered, it is often this angle that produces the most “Aha’s” from leaders who begin to see the psychological importance of their role, authorization, leadership behavior and spiritual maturity within the community. • A third dimension involves the professional disciplines that can enrich visioning and future discernment, such as planning and change management. Discernment methods and contemplative dialogue should involve the heart and the head, integrating feelings, values, prayer and prudential judgments that come from insightful planning. Closely aligned with planning is the experience of change, which is strongly impacted by leader behavior. These disciplines are not usually new in concept, but religious groups don’t often use them effectively. The seminar experience contains a mix of pre-reading, input sessions, journaling, and opportunities for co-consultation with peers to relate the concepts to member experiences. The location, Cranaleith Spiritual Center in Philadelphia, provides the environment of serenity, beauty, and delicious farm-to-table nourishment. The feedback has been very positive – the seminars help leaders with several desired outcomes. They gain a deeper understanding of the human dynamics evoked by experiences of change, conflict, and transformation; they have greater awareness of how leaders contribute to the health and capacity of the congregation through their willingness to stand faithfully in the authorization of the leader role; and they gain confidence and mutual support from exploring shared realities with other leaders.